So yeah, we have info on one ep in Album 64: David and Absolam. Theorize about the rest of the album here! Is that confirmed as 64 or is it a club episode? Considering they just finished recording 63, I doubt it's for 64. I think they recorded it last weekend. And I'm really excited about that episode! I looked up the story and it sounds incredible! I hope we'll get more Meltsner episodes of course. (Maybe have Skint come back? Please?) Yeah but since I haven't heard 63 and that's all we know, I don't have much else to theorize about. You guys saw the cover art, right? I swear that is a plane in the corner. Something's up. Like the plane. (hahaha terrible joke). 1. Whit and Eugene go on a father-son fishing trip and 'happen' to meet up with Penny and Wooton who are geocaching in Trickle Lake. 2. The gang is out looking for evidence in order to incriminate a suspect, and the camera has the proof needed. 3. Some weird family Whittaker family secret leads Whit to the water, and of course, his friends volunteer to come along. Side note: There's a sort of metal cable in the right hand corner below the plane. Is that a second fishing rod, or a tether, or something else? Okay, this is a stretch I know, but hear me out. What if fishing is a cover story? Maybe the good guys in Odyssey are being watched by whatever bad guys we're dealing with here, and need to find the camera without them knowing, so they pretend to go fishing! That's probably not what's happening but I think it'd be funny for Whit to get all decked out for some fake fishin' fun! I also really hope that Buck is in that boat with them. I mean they ARE going fishing after all. I think it's just a law in Odyssey that you can't go fishing without Buck! Other than that I need more info about the album to really predict anything, but I like what I see so far! Oh, but maybe we'll finally find out about Buck's past since the cover says the stories are about secrets. What if fishing is a cover story? Maybe the good guys in Odyssey are being watched by whatever bad guys we're dealing with here, and need to find the camera without them knowing, so they pretend to go fishing! Oh my gosh I think you're right!! Because here was the question I was thinking about, Eugene hates fishing, why would he go fishing?? But if it was a cover, to keep the bad guys from seeing that they are looking for the camera, that would explain it!! Wow. We already have the album cover? I really hope we don't have to wait a year for this one. 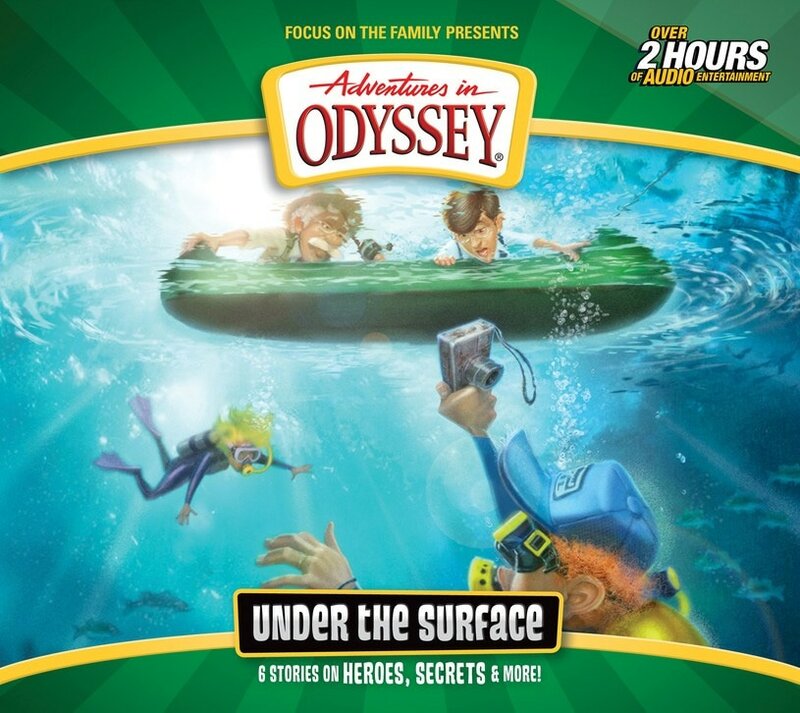 "A scuba-diving adventure leads to an unlikely investigation as Wooton and Penny try to find the owner of a camera they discovered at the bottom of Trickle Lake. And that’s not the only long-hidden secret being uncovered in Odyssey! When Whit sends Olivia and Matthew on an Imagination Station adventure to Old Testament days, the pair discovers that their heroes have unpleasant dark sides too. The Jones & Parker Detective Agency investigates an author’s long-lost final manuscript and discovers that the mystery may be bigger than they ever imagined. And after Buck laments his lack of family connections, Eugene takes him on a road trip to find more about the boy’s bewildering personal history. In these six thrilling adventures, you’ll discover the reason millions of people can’t wait to hear another exciting adventure in Odyssey!" "When Whit sends Olivia and Matthew on an Imagination Station adventure to Old Testament days, the pair discovers that their heroes have unpleasant dark sides too. Is this where the David and Absalom story comes in? I hope that that is not an OAC episode. Tragic as it is, Bible stories like that need to be told. They stand out in the mind and impress the consequences of sin in a realistic manner that is something special. The above summary makes me very happy. Album 59 was my last album that I have listened to at this point (I have Album 60 and 61 to listen to. ), but I feel that each album of "Odyssey 2.0" gets better and better. If only we still had two twelve-episode albums a year still. Whit took Eugene fishing because Whit has a hankering for bass, and if he takes someone that does not like the activity, he can catch the limit for both people and have more to eat. Is this where the David and Absalom story comes in? Yes it has been confirmed that David and Absalom, parts 1 and 2 are in Album 64.
haha the bass comment. Maybe they are fishing for Old Grundy again. Lol how about we keep this an Album 64 thread. You guys do realize that Nathan Hoobler told me himself that it's pretty debunked at this point even though some of the writers don't think it would be too weird. Not all of them think it would be really weird but none of them ship it. And none of them really ship Connie and Jeff either, apparently. It has always been my theory that they just brought back Jeff to introduce the Adventures in Odyssey Club. So. Album 64 theories. The Buck and Eugene road trip I am a little ancy about considering that we had a similar plot with Eugene himself way back when. I think the Buck and Eugene road trip would be pretty cool for that reason, actually, as long as they don't spend the entire thing making references to Album 21. Actually, I think it'd be great if Eugene did all this wacky stuff to try to make the trip as memorable as the one he took with Bernard was, only Buck just thinks he's trying too hard and being overbearing, and both Eugene and the audience learn that instead of hanging out in the past and trying to make everything just like your nostalgic memories, you should live in the present and make a new nostalgia just by being yourself and letting God take you on the journey. That would be a great moral, but I doubt they'll focus much on Bernard and Eugene's road trip. It sounds like the episode will be mainly about Buck's family past, which I'm very excited about. Overall I hope this episode is good because it's really the only one I'm especially looking forward to in the album. I am literally dying!!! I am in shock! AAAHHHHHAHAHAH There had better be a really good reason, but even if there isn't, I think this will be entertaining. I'm not going to even think about that nonsense. On another note, the one where Eugene takes Buck on a road trip to learn more about his family could be very sweet, and perhaps a little sorrowful. I think I've mentioned being excited to hear his backstory before.